History has always been a passion of mine. My favorite classes in high school were always history classes, so much so that I would take optional history classes as electives when my schedule permitted. Something about knowing about the lives of the people who came before has always appealed to me in a way that I can’t quite explain. 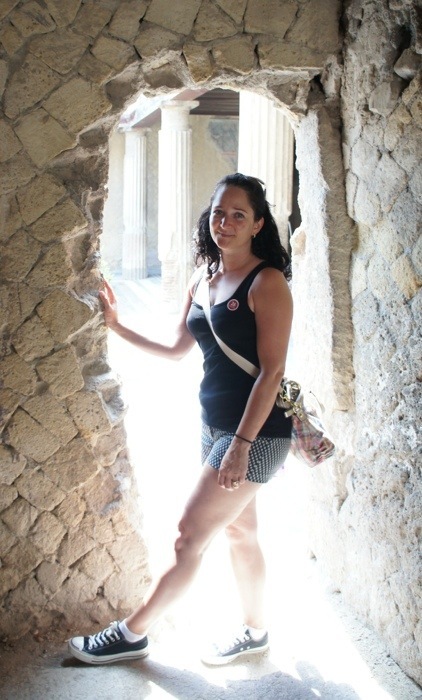 To learn about ancient civilizations, to learn how our ancestors lived, to find out where we came from; it has always given me a sense of belonging, a feeling that I was connected to something bigger and more important than my own life. While life certainly didn’t begin in Rome, I attribute modern civilization to the Roman Empire. Democracy, freedom of thought, embracing and encouraging the culture of art, poetry and beauty – where would we, as a modern society be, if it weren’t for Ancient Rome? My feeling this way about Rome, about Italy, and Europe in general, meant that when I was invited to attend a press trip with Carnival Cruise Lines on the newly renovated Carnival Sunshine cruise ship with ports of call throughout France, Italy and Croatia, well, it was a dream come true. I didn’t have to research our ports of call in Italy very much, because I knew what I wanted to see. The Leaning Tower of Pisa, the Vatican Museums, the Sistine Chapel, The Pantheon, The Colosseum, and of course, Mount Vesuvius. 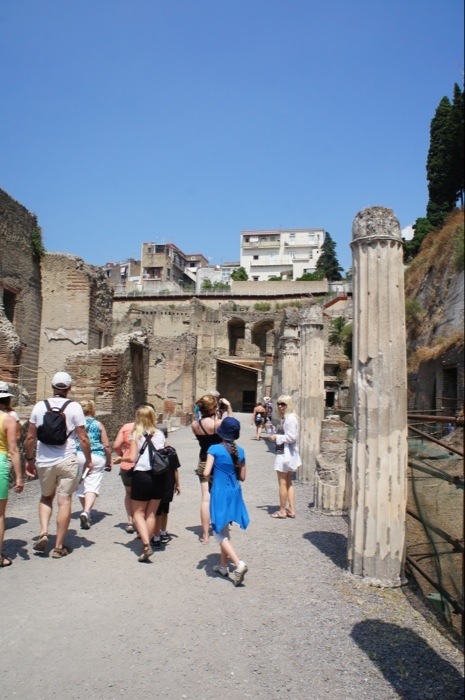 On the morning that the Carnival Sunshine stopped in Naples, I had booked the Ancient Herculaneum shore excursion with Carnival Cruise Lines. It was $75 per person (Angeline qualifies as an adult, so no discount applied) and included transportation from the Carnival Sunshine ship in the Port of Napoli to the ruins of Ancient Herculaneum, a guided tour of Herculaneum with an English speaking guide, as well as a stop at a famous cameo factory in Naples and transportation back to the ship after our excursion was over. It was worth every penny. How can I describe what it felt like to gaze upon the skeletons of the men and women in the boathouses of Herculaneum, the people who sought shelter there and died instantly when they breathed in the poisonous air? To walk the streets paved two thousand years ago, to see the mosaics on the walls, the pottery on the shelves, the paintings in the homes of what were surely wealthy Romans? It was surreal. I found myself blinking back tears more than once. Our guide, Guido (seriously, I couldn’t even make up such a perfect name for our guide if I tried! 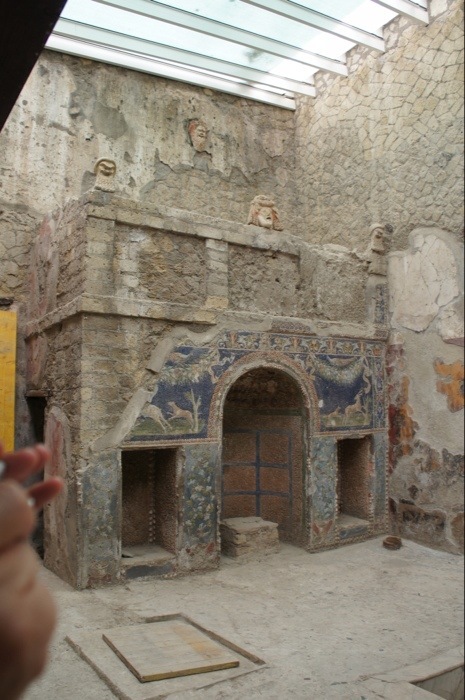 ), knew everything there was to know about Ancient Herculaneum. I knew quite a bit before our tour, having learned about the eruption of Mount Vesuvius in 79 AD back in one of my history classes in high school, and subsequent documentaries watched over the years. Guido knew things I’d either never learned or had forgotten, and he made our tour that much more special. If you’ve never heard of Herculaneum, you would learn everything you need to know to appreciate the ruins – and to find a newfound appreciation for the active volcano looming above the city as you walked the streets of the people once annihilated by it. Everyone knows about the destruction of Pompeii in 79 AD, covered in lava and ash from the famous eruption of Mount Vesuvius. But many don’t know about the similar destruction of Herculaneum, a neighboring city frequented by vacationing Romans that was destroyed by mud and excellently preserved. 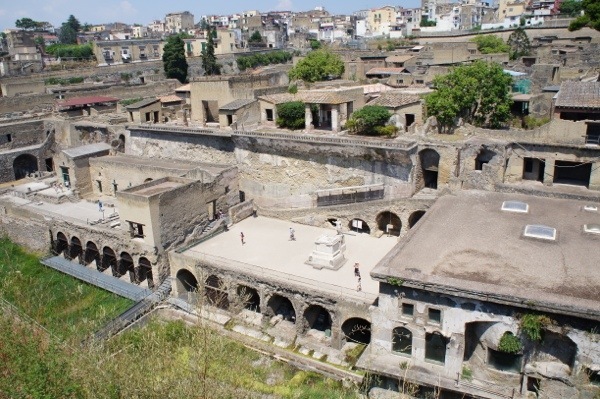 Herculaneum was actually founded by the Greeks, and the Romans didn’t come until some 500 years after the fact. Located on the beautiful bay of Napoli, it was a place where the wealthy came to holiday, and was much smaller than Pompeii. Like Pompeii, Herculaneum felt the eruption of Mount Vesuvius and moved towards the sea to escape the lava – but the waves were so high in the sea that they couldn’t leave, and when no lava came, most people went back to their homes. Who knows what might have happened if they had been able to depart by sea? 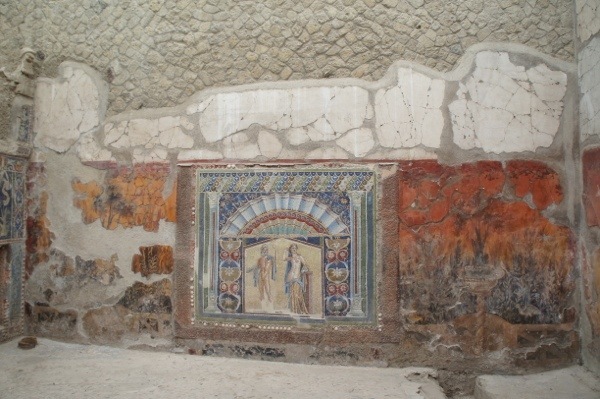 The ruins of Herculaneum are an archeological treasure trove. The city didn’t fare as bad as Pompeii, as the lava and ash that destroyed Pompeii was matched by a wall of mud and incredibly hot air in Herculaneum. While the people died instantly when breathing in the air, their remains are totally intact, though archeologists have only discovered about 300 bodies out of the thousands of residents. As you walk the streets, you’ll find homes with baths and fountains intact, intricate mosaics on the walls, painted dining rooms, even a communal bathhouse and spa. It isn’t difficult to imagine what life must have been like in Herculaneum, which makes it an all that much more sorrowful experience. 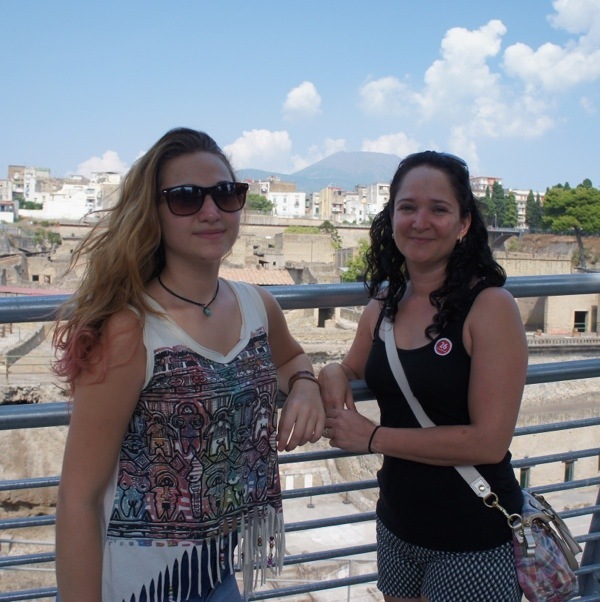 Angeline isn’t into history, and knew nothing about Mount Vesuvius or the destruction of Pompeii or Herculaneum…yet this was her favorite experience thus far! The experience is THAT powerful. You can find out more about the Ancient Herculaneum shore excursion with Carnival Cruise Lines, and the Carnival Sunshine cruise ship and its Mediterranean ports of call at Carnival.com. « Insidious Chapter 2 Hits Theaters on September 13th!